A superb ruckman, Brian Lowe experienced a highly successful playing and coaching career in both major football competitions in northern Tasmania, either side of a short VFL career. His record as a coach makes for even better reading, guiding all four clubs he coached to premierships. Born in 1939, Lowe’s football journey began with Rossarden in the Fingal Football Association before being recruited to NTFA powerhouse City-South in 1957. In four seasons with the Redlegs, Lowe developed into a hugely promising young footballer, playing in back-to-back premiership teams under Stan Morcom in 1959-60, winning the club best and fairest award in both premiership years and representing the NTFA on numerous occasions. 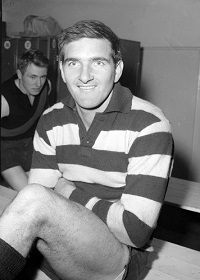 The young ruckman’s performances in Tasmania quickly caught the attention of VFL recruiters and after approaches from many clubs, Lowe signed with Geelong ahead of the 1961 VFL season. From 1961-63, Lowe made 36 senior appearances for the Cats under the great Bobby Davis. The club played off in Grand Finals in 1961 and 1963, however Lowe unfortunately did not feature in either of them, and was in fact dropped for the latter decider after the 2nd Semi Final in favour of returning champion Alistair Lord. Although devastated at his omission, Lowe still gave his all for the club, and was voted ‘Best on Ground’ in Geelong’s 37-point victory over St. Kilda for the VFL reserves premiership. It was his second piece of silverware in Cats colours, having been a member of the Night Series premiership team in his first season. Lowe returned to Tasmania for the 1964 season after accepting the captain-coach position with Cooee in the NWFU. In his first season with the Bulldogs, Lowe led the club to their maiden Tasmanian State premiership triumph, while his own personal form saw him receive his first of eight Tasmanian jumpers. Cooee went back-to-back in the NWFU in 1965, a season in which Lowe claimed the Alstergen Trophy as the Union’s best player in representative matches. 1966 however brought arguably the greatest heights of Lowe’s career. Although Cooee failed to make it three flags in a row, Lowe’s personal form was phenomenal, selected to captain the NWFU in intrastate football, winning his second successive Alstergen Trophy and being chosen as vice-captain of the Tasmanian team for the National Carnival in Hobart. Lowe returned to the NTFA – but not City-South – in 1967, taking up the position of captain-coach with East Launceston. For so long the NTFA’s perennial battlers, Lowe’s arrival was the catalyst for East Launceston’s first – and ultimately only – senior premiership, courtesy of a thrilling two point-win over North Launceston in 1967. East Launceston was back in the Grand Final two years later, however this time they were on the receiving end of a 44-point loss to Launceston. Lowe departed East Launceston after five seasons as coach at the end of 1971, subsequently spending several seasons in various playing and coaching roles with Westbury – at one time coaching a very young Michael Roach – and back at East Launceston, before finally announcing his retirement – or so it seemed – at the end of 1978. After relocating to Queensland in 1979, he was lured out of retirement for one final season as captain-coach of Southport in the Gold Coast A.F.L., guiding the club to a premiership before finally retiring permanently at the age of 40.